You are probably familiar with SBC Industry News, but have you ever stopped to think about how many people it reaches? Weekly, this email goes out to more than 4,600 recipients. Between the weekly email distribution and the traffic to individual news headlines on the SBC Magazine website, impressions generated by SBC Industry News is upwards of 300,000 per year! 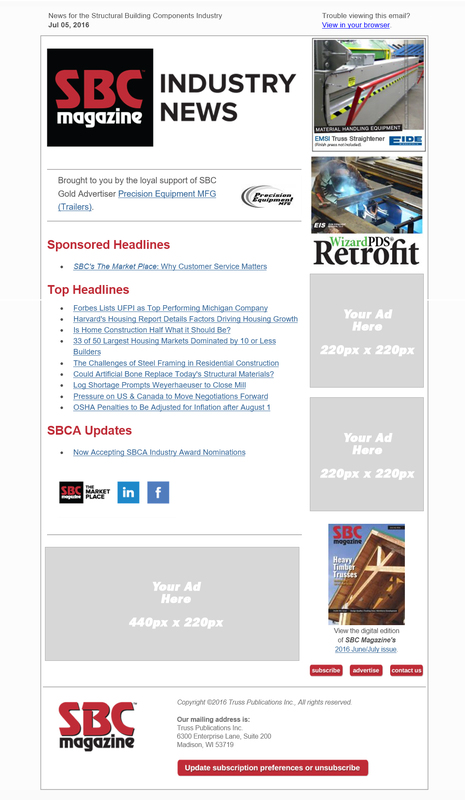 Each week provides the opportunity for as many as four advertisers to sponsor industry news and provide a 220x220 pixel ad for display both in the email blast and on every Industry News page on the site for that week. A 440x220 pixel space is also available for $100 per week for display in the email only. (View a sample of the news template here.) Space is provided on a first-come, first-served basis. First right of refusal will be provided to the advertiser(s) that was contracted for the most issues in the previous year. If SBC Magazine does not receive confirmation in writing by a specified date, the opportunity will be made available to all program advertisers. A 10-week minimum contract is required to advertise in SBC Industry News. Thousands of readers are only a click away! Your headline will get delivered at the top of the list in a special "Sponsored Headlines" section. Each week's news will allow space for two Sponsored Headlines, so your message is sure to get noticed. Any content submitted that is contrary to SBCA policy, which has been created to support its component manufacturer membership, will be reviewed by SBCA's elected officers for approval. The same headline/content cannot be run in two consecutive weeks. The content and the headline must be supplied by the sponsor. SBC Staff reserves the right to refuse any content that communicates a false statement and/or harms the reputation of an individual person, business, product, group, government, religion, or nation as well as other various kinds of defamation that retaliate against groundless criticism. The cost for Sponsored Headlines is calculated on a per click basis, per the table below, with a minimum cost of $50 and a maximum cost of $300. You will also receive the email addresses of all readers who click on your headline to use for ongoing follow up. The free ad that each program advertiser is given as a part of their contract will rotate throughout the site on secondary and tertiary pages. In addition to that space, we are offering monthly premium ad placements on the Current Issue, Archives and Housing Starts pages. These ads are 220x220 pixel ads with direct links to your company's website. Space is provided on a first-come, first-served basis. First right of refusal will be provided to the advertiser(s) that was contracted for the most issues in the previous year. If SBC Magazine does not receive confirmation in writing by a specified date, the opportunity will be made available to all program advertisers.